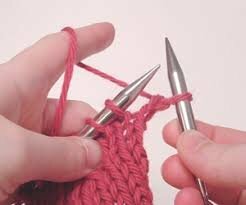 Picking and throwing are other names that the two knitting styles go by. Continental is also sometimes called German knitting, Brigitte will teach the ins and outs - be prepared to challenge your dexterity!! The main difference between the two methods is that with English knitting you hold the yarn in your right hand and "throw" it over the needle. In continental knitting, you hold the yarn in your left hand and "pick" it as you form stitches. Some people call it "left-handed knitting," but no matter which hand holds the yarn, you use both hands when you knit. It's worth learning both methods because it helps with stranded knitting and it allows you to determine which method you like better. Proponents of continental knitting say it's faster. In general, it does use a smaller movement of the hands and arms than English knitting does. This can make it faster when you get the hang of it and it may be better for you if you have repetitive stress injuries.